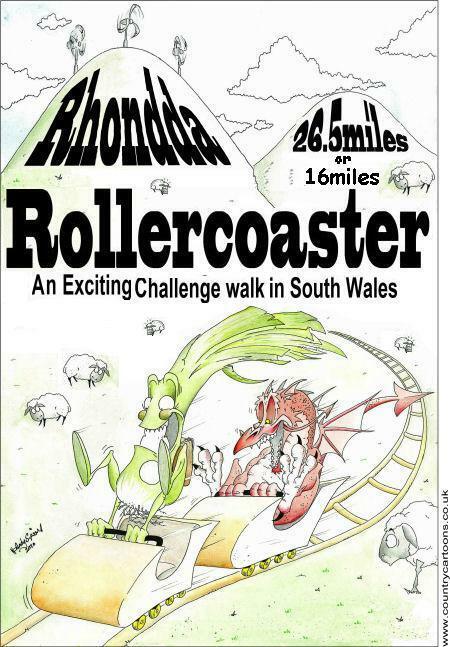 The Rhondda Rollercoaster is to be re-named in memory of South Wales group member Gwyn Matthews who was intimately involved in the creation of the event. This scenically beautiful route starts in Trehafod, and follows a clockwise circuit visiting Mynydd y Glyn, Mynydd Dinas, Mynydd William Meyrick, The Bwlch and Ferndale before returning to Trehafod via the iconic Tylorstown Tip. The route provides extensive views of the South Wales valleys and the Brecon Beacons to the north. The 26.5 mile route has approximately 5000 feet of ascent and the 16 mile route 2900 feet of ascent. This event, held for the first time in 2011, is organised by the South Wales Group of the Long Distance Walkers Association (LDWA) and is open to non-LDWA members. Read one man’s report of the 2012 event. A report of the 2011 event, written by a participant, was published in the LDWA magazine, Strider, in August 2011. For reports of the previous events follow the menu links on the left.